Speak up, it’s your city! Our #EnableChange fundraiser has come to a close. To all of you who pitched in – by making a donation, by becoming members, by spreading the word, by writing for us – a big, big thank you from all of us at Citizen Matters. It is only because of your support that we will be able to continue doing what we do. Please give yourselves a pat on the back, for it is your help that will continue to #EnableChange in Bengaluru. At last count, 121 donors have helped us raise Rs 4.76 lakhs in the past couple of weeks. And here are the folks who have helped us get there. If you have made a donation, and don’t find your name featured here, please mail us. We will be issuing the 80G receipts for your contribution across this week and next. If you would like to help close the gap, so we can meet our fundraiser target, consider becoming a member with a recurring contribution every month: click here. If you would like to make a one-time donation, click here. Bengaluru will be the first Indian city to manage waste scientifically, by enforcing three-way segregation. Perhaps, cities suffering from dumping and air pollution can take a cue from Bengaluru now. Read how the 2Bin1Bag concept works. The Chennai floods taught a lesson or two regarding better coordination among agencies. What is the system in Bangalore? Which departments are supposed to handle emergency situations? Read: How is Bengaluru supposed to handle disasters like floods? Several Indian cities have banned plastic in theory. How far did the the practical implementation go? Read: What does Karnataka have to learn? Though Bengaluru is in the grip of rising air pollution, no one is complaining because of the lack of awareness. At this rate how much time will we need, to reach Delhi’s pollution levels? Read: Air pollution level very high in Bengaluru. Fix potholes, lay new roads, earmark zones for vendors/kiosks, remove encroachments, constitute a committee – these are some of the demands that citizens had when they took to the streets to protest against terrible condition of infrastructure in the ORR-Sarjapur Road area. Here’s how the Fix My Road protest went. Though major accidents take place on NICE Road, there are no speed limits. When the police try to regulate traffic there, how does the company managing the road react? Read: The not-so-nice realities of NICE Road. Janaagraha’s Street Quality Score study says 75% of footpaths in inner Bengaluru, and 58% in outer part are walkable. They believe the score can help take informed budgeting decisions for the city. Read: Janaagraha’s Street Quality Survey. A water tanker draws up water from an abandoned quarry. Where will this water be supplied? Is it safe to drink such water? And importantly, can one rely on water tankers for safe drinking water? On camera: The reality of ‘drinking water’ tankers. A group of runners from Bengaluru will be running 13 half marathons in 13 different cities across India. Read how Mera Terah Run is raising funds for three NGOs. A Bangalorean who was involved in the relief work in Chennai shares his experience. Many went out of their way to help people who they did not know, he says. Read: Bengaluru for Chennai. BBMP contractors who cause damage to private properties refuse to repair them. A senior citizen voices her concern on the issue: Save us from BBMP contractors, please! A commuter who wants to park her car in Metro station finds private ‘for hire’ vehicles parked there. Read: The Metro is Namma, but what about its parking lot? 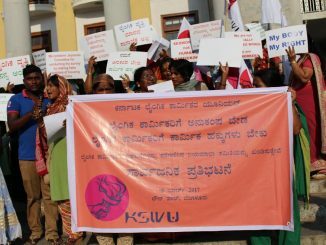 A citizen shares how the Bengaluru police helped her out when she went to report an incident of abuse. In Bengaluru, nothing is a better conversation starter than traffic. Yet another post from our youngest blogger: Life, the universe and auto drivers. Bengaluru is included alongside 75 of the biggest cities in the world in the Youthful Cities survey. So how does living in Bengaluru impact you as a citizen? Your response could help make Bengaluru be a more livable city. Valmiki apparently wrote the first verse of the Ramayana after he saw a hunter kill the male of a pair of courting Demoiselle Cranes. Deepa Mohan documents the very first sighting of the bird in Bengaluru. The annual fest at Turahalli forest saw participation from volunteers, bird-watchers, nature walkers, rock climbers and others, to celebrate one of Bengaluru’s last remaining lung spaces. Read: Volunteers clear out 150 kg of waste during Turahalli Day. Being a regular at a library or even a second hand bookstore is about appreciating serendipity – you never know what you might find. Read: A letter from the library. Watching a play or going to a music recital is no longer a relaxed affair. To get a good seat, one must be at the venue early enough, after traversing through Bengaluru’s crowded roads. Read: Being an outsider. Here’s an instance where the adage, ‘Safety in numbers’, is not apt. Looking up is as much of a delight as looking around. In a latest circular, BBMP engineers have been directed to strictly penalise those who do not segregate waste. The engineers who have been mandated to go on door-to-door visit, will knock at your door and impose a penalty of Rs 500 if you do not segregate waste. The residents of Goraguntepalya have set fire to two garbage trucks, alleging that the trucks were dumping garbage illegally. The trucks belong to the contractors who are managing city’s solid waste. The government has withdrawn its plan to introduce a high-speed train between Bengaluru-Mysuru which was a long-pending demand of the commuters travelling between these two cities. The Chief Minister said that the decision was taken after a study on the proposal showed that the project was not viable. In an attempt to control the use of plastic, BBMP has declared plastic-free zones in various parts of the city. As a first step, the programme is being implemented in 11 wards in Yelahanka zone, where shopkeepers will be provided with cloth bags. Following their protest against poor infrastructure, Whitefield residents have now decided to form ward committees to strengthen the administration. The screening for ward committee members was held at Varthur and Kadugodi on December 19th and 20th respectively. All irregularities that are said to have taken place in BBMP will be probed by a retired High Court judge, Bengaluru Development Minister K J George has said. The retired judge will be appointed shortly and a panel of three chief engineers will assist him. Magician Nicolai Friedrich is performing at UB City on December 21st. Neenaanaadre Naaneenena, a Kannada adaptation of Shakespeare’s A Comedy of Errors, is being staged at Rangashankara on December 22nd, 23rd and 24th. Several questions have been raised ever since the release of the results of the Religious Census a few months back. KS James will be talking about its implications at Bangalore International Centre on December 23rd. Best Kept Secret will be performing a tribute to Coldplay at Hard Rock Cafe on December 24th. Walk, shop, snack and learn about Bengaluru’s colourful heritage markets at the Johnson Market Walk on December 25th. Want to engage your child in some unusual activities this winter? Below are some interesting things to do in the city this December. Perhaps the essence of the groundswell for Anna Hazare comes out best in these words. A Bangalore businessman who said this was among the thousands at Freedom Park on Sunday.